Form: This manuscript page, made on animal skin, marks the evolution of Christian manuscript making. Manuscripts combined two forms of art, calligraphy and painting. The term calligraphy literally means beautiful writing (kalos: beauty graphos: to write) The letters and words are written in silver (now tarnished black) in Greek and follow a fairly unified style of script without much of the variation and ornamentation that develops later in Christian and Islamic manuscripts. The page was conceived of as a whole composition in which the words at the top, packed tightly and uniformly across the surface, balance with the almost frieze like image beneath. The narrative beneath starts at the left and continues around in a reversed "C" like shape. Multiple scenes with the same characters inhabit the same space. 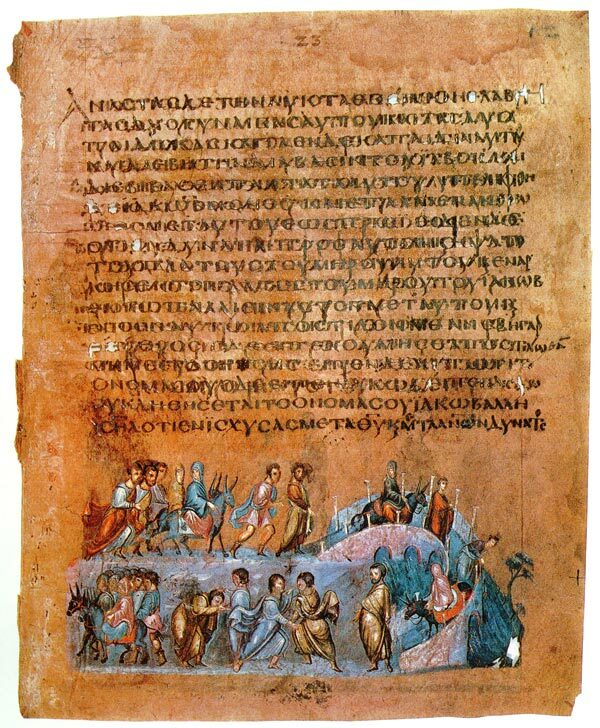 This convention referred to as a continuous narrative, run throughout the entire manuscript and mimic the paintings of Dura Europos. Iconography: Color and the materials used to adorn the book are iconic. The silver and gold paint elevate the physical and therefore highlight the spiritual value of the text. The same is true of the expensive purple dye of the page which is also symbolic of royalty. (Note the purple robes of Theodora and Justinian above.) The decorative qualities of how things are written, called calligraphy (calos- beautiful graphy- to write) is symbolic in and of itself. The beauty and care in which the letters, words, and decorative forms are written is symbolic of the beauty of the meaning of the words and phrases. Figures are represented very much like Christ figure from Hagia Sofia, which exists from the 13th century. The drapery stylization and face are the same. Context: Early Christian artists or calligraphers, borrowed and developed the decorative forms of calligraphy from the Romans, Greeks and sacred books of the Jewish Torah, in order to decorate and honor the words of the Old and New Testaments.